Tompkins Square is very proud to announce the signing of Welsh multi-instrumentalist, Gwenifer Raymond. Hailing from Cardiff and now residing in Brighton in the South of England, Raymond began playing guitar at the age of eight. 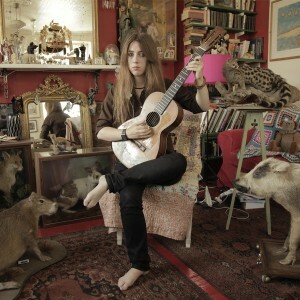 Tompkins Square released her debut 7″ on Record Store Day. When I was about eight years old a pretty formative thing happened to me … my mum bought me a cassette tape of Nirvana’s Nevermind. Being so young I’d had no real interest in music prior to that, but I did have a ‘My First Sony’ cassette player that I used to listen to audiobooks. Anyway, I put the tape in, pressed play, and what I heard blew my little 8 year old mind. I don’t know what it was about that wall of sound that so captured me, but I spent many hours hyperactively running around the house with headphones on, volume at full blast, and Nevermind on repeat. It was either for Christmas or my birthday that year, that I asked for a guitar. I spent all my teenage years playing either guitar or drums in various punk and rock outfits around the Welsh valleys, but around that time I was also getting seriously into older stuff, Dylan, The Velvet Underground and the like. Through those cheap compilation CDs you could get then, I found that a common influence amongst these guys was pre-war delta and country blues, as well as Appalachian music. Eventually I stumbled upon Mississippi John Hurt, Skip James and Roscoe Holcomb, and they became the holy trinity of musicians I so wanted to able to play like. Eventually, I tracked down a blues man in Cardiff who could teach me and it was in studying these guys that I was introduced to John Fahey and the whole American Primitive thing. I’ve always loved being in bands and the sonic chemistry it produces, but at the same time it’s always a bit of a compromise that those sounds in my head have to pass through and be translated by someone else’s. Sometimes it can be for the better, but sometimes not so much. American Primitive was the first time it had occurred to me that you didn’t really need anything more than one solo instrument to fully express yourself, especially when those feelings and moods refuse to be articulated in words, sometimes it’s a mystery to yourself what it is you’re expressing. I still play in hard rock and punk bands and love to wail and hit my guitar with a complete lack of any subtlety or nuance, but in the end I think that all these things are really part of a circle, feeding back into itself. It’s all just a lineup of strange mutations.